Which dating sites will survive? Most dating sites rely on advertising and premium memberships and live on the margin between advertising costs and revenue from membership fees. This is a hard business - not many reach the status where they make more then 1 Euro on every Euro they spend on advertising. Also, it is hard to get members to sign-up on a dating site and not every "expensive" visitor through a sponsored link (e.g. Adwords, Facebook) will result in an active member and not every active member will end-up paying something. Now that the financial crises reaches many countries, also people are less willing to spend money on online dating. This might kill many dating sites that already had a hard-time trying to make more money on membership fees then spending on advertising, customer support and everything related to running and maintaining the website. Another danger for many dating sites is Facebook: in real-life many people meet their partner through friends. Now with Facebook, it becomes even easier meeting friends of friends and Facebook also helps singles to meet their partner directly or indirectly. People also have a limited time to spend online every day - the more time they spend on Facebook - the less time they will spend on other websites such as dating sites. Facebook, however, might become victim of its ipo in the near future - the stock market can be a friend of a business or an enemy. How are the dating sites doing now? 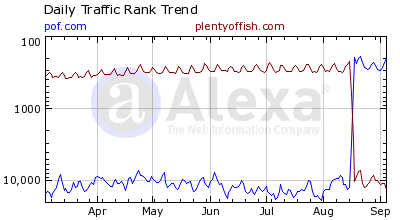 Plentyoffish is still "in recession" - the traffic still keeps on falling for the last 3 months. One of the internet dating dinosaures is now also loosing some traffic - however only slightly. They still seem to be *kind-of* stable. 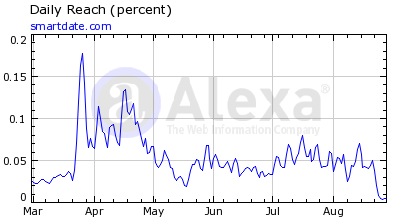 What about the stock-market rockers Cupid Plc and their flirt.com site? Flirt.com is run by people with loads of money and loads of knowledge about how to pull the last cent out of every visitors nose and how to maximize the conversions. Also they always find cheap dating sites to acquire (12-36 months revenue as a sales price) which usually reach their break-even after 3-6 months. But what about their flagship, flirt.com? How does it perform? Let's put it this way: it could do better. All the breaks in the graph is probably when the advertising budget is reduced...and the spikes when they spend loads of money on advertising within a short time. So the rearlight of this comparison if flirtomatic - a really sad example of how venture capital can be spent the most useless way. What about those French internet guys with all the media coverage last year on how cool this company is? They also received (and spent?) millions of Euros...and what's the status of Smartdate.com? 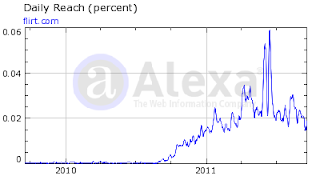 I love the final blimp on Alexa...the last resurrection attempt...fighting with its venture capital death. If you have a pet, you probably know this already: If you feed animals too much they die. 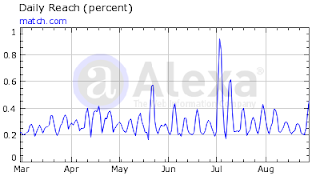 In theory, this might be due to an increased usage from mobile phones, which is not reflected in Alexa stats. However, more likely, this is due to the site itself - nowadays you don't get away that easily with such a poorly (selfmade) website. Markus should invest some money into a new design and better usability - and outsource it instead of trying to do everything himself. Smartdate.com is dying? 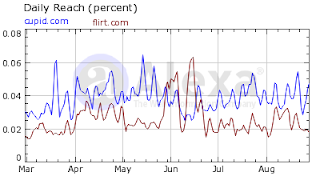 Flirt.com also in reverse-gear? 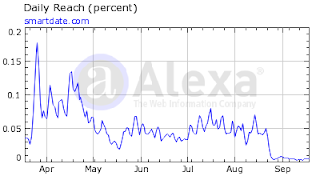 Quite embarrassing really....despite millions of cash, the site seems to be dying? However, Cupid Plc also maybe focusses on other sites of their network more right now. All of their dating sites are probably competing with each other, so that only the best dating sites will be kept in the long-run. 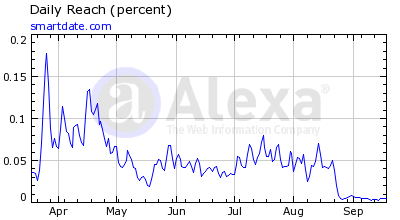 So, pof.com now has an Alexa of 200 - which is a decent rank for a dating site. 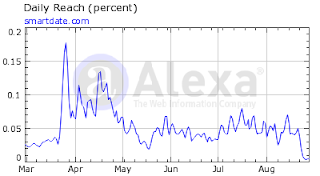 I wonder how the mobile traffic compares to the website traffic. According to Android market/iTunes the mobile app has 500,000-1,000,000 downloads so far. Let's have a look at what's going on right now on the online dating market. First of all, let's check how Cupid Plc is doing, after they have received millions through their ipo last October. After their initial increase in traffic before/after the Cupid Plc (Easydate) stock came out, the traffic seems to have fallen quite a bit. 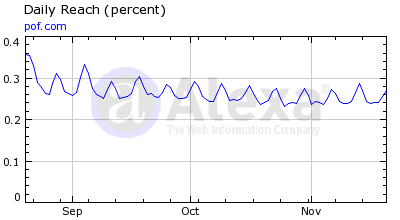 After that, there seems to be a kind of stable (saturated) traffic level for cupid.com whereas flirt.com still seems to fall in traffic for the last 6 months. What about "good" old match.com? They should have the best knowledge by know about the market as they are here for quite a long time now. 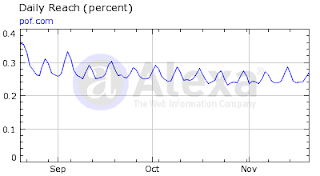 Their traffic seems to be extremely stable. 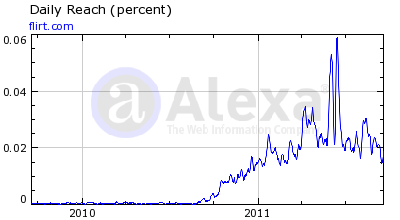 Nobody expects it will ever grow massively, but obiously match.com will stick around in 5 years or even in 10 years. How is Markus doing with his plentyoffish.com 1-man-show (almost) ? wtf? 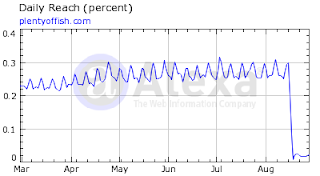 Thought I could write the traffic is still growing slightly...like the last years. But look at that! 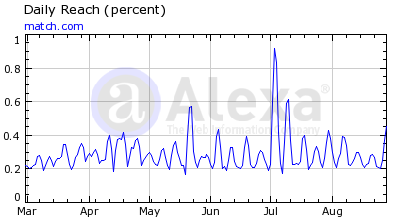 The traffic has suddenly fallen? Panda update from Google? Some other tricks Markus was doing are not working anymore? Or are all users moving to the mobile apps now? What happens when you spend maximum budget on advertising a dating site? Have you ever wondered, how much traffic your website could get if you spend the maximum possible money on advertising a dating site on the internet? There is smartdate with plenty of venture capital and flirt.com - with loads of money through the ipo/going to the stock market. Both can afford to spend enough money to "buy all ads" on the internet for this target group. 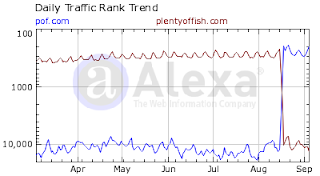 As you can see, they also have similiar traffic - this means also the conversion seems to be similiar - and probably represents the "maximum you can achieve" with a pay-model on a dating site that gets almost al of its traffic through online marketing / advertising. Smartdate is one of those companies that receive(d) millions of venture capital and can spend it with both hands. Smartdate is not a free dating site however - it is a pay site. My advise it to keep on partying - you never know when the party is over. [...] Flirtomatic is getting a little facelift! There comes a time in everyone’s (and every site’s) life where a little... ”refresher” is needed and at Flirtomatic, that time is now. Wow! Over the next few months(?) - and what's the point of announcing it in the first place? Haven't they had a redesign recently? The last redesign was terrible...although the original design wasn't that great either. After an unsuccessful attempt to use this domain for multi-user blogs and after quite some idle time where the domain kicked around unused, I have now decided to blog about dating, flirting, men&women as well as the dating industry.